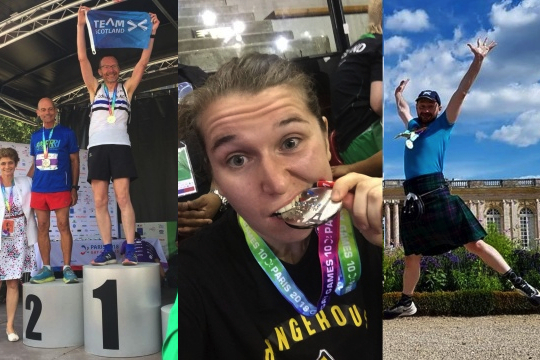 For the first time in it's 36 year history, a Team Scotland took part in the Gay Games which this year took place in Paris. The team have been supported by a partnership between LEAP Sports and City of Glasgow College. The team have picked up an incredibly impressive haul of medals with 5 gold, 6 silver and a bronze. 3 of the golds went to Bill Gardiner on the track, with Miki Lee Dale and Ian Williamson picking up golds in rowing and the marathon respectively. Nick Dickson took silver medals in the 10K and 5K events with a further bronze in the half marathon. Mika Bosphore-Ward won 2 silver in ice skating whilst Natalie Deans was a silver winner in boxing and Jonathan McBride a silver winner in squash. Team Captain, Fraser May of the mighty Hotscots FC who were taking part in their second Gay Games said that "the very fact that we had so many people competing as part of Team Scotland was a massive thing and hopefully something to build on, but walking into the opening ceremony together was something for us all to be very proud to have been part of. The fact that so many in the team were successful in winning medals was a real cherry on the top". Boxer Natalie spoke to us afterwards and reflected on the experience “Paris was my first Gay Games, my first competition in boxing at all actually, and I loved every moment of it...Boxing solo was an experience I wasn’t used to, every other competition or sport I’ve ever been part of has been part of a team, which is why I loved being part of Team Scotland because it allowed me to get involved and be part of something a bit bigger for things like the opening ceremonies. Overall the atmosphere of the Games was amazing. Even though it was a competition everyone really got into the spirit of it being a fun inclusive competition." For some, it was a very personal journey such as Mika "For me this was a life changing experience. I have gained so much personally: I feel stronger, happier and prouder to be me!" Meantime, Jonathan felt that seeing the support that sports bodies give to movements like the Gay Games these days is an important validation. "I was pleased to see the national squash governing body in France involved in the squash competition. They published a supporting piece on their website and it means a lot to have the competition recognised in that way." You can read our previous Team Scotland update here. Photo left to right: Ian Williamson on the podium after the marathon, Natalie Deans following her silver win, and Bill Gardiner celebrating his triple gold success. Written on 18th August 2018.